Before you can use API Portal, you must connect it at least one API Manager. By default, API Portal uses ports 80 and 443. You can access the ports using a browser. Log in to the Joomla! Administrator Interface (JAI) (https://<API Portal host>/administrator). Select Components > API Portal > API Manager. Enter a public name for your API Manager. This name is shown to an API consumer when listing the available API Managers, see Configure the connection to slave API Managers. Enter your API Manager host and port. The default port is 8075. Set Verify SSL connection to Yes to verify the SSL peer certificate for HTTPS connections. 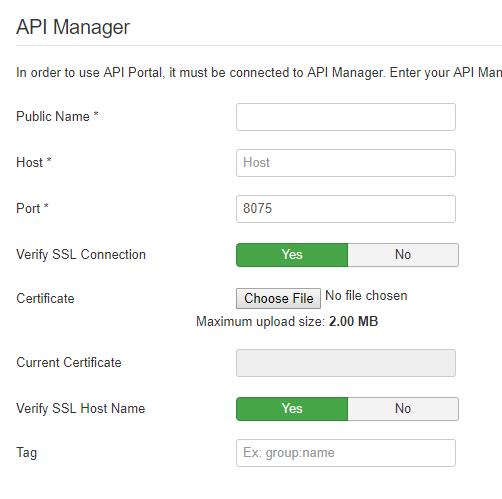 In Certificate, choose and upload the API Manager certificate. This certificate is used to validate the API Manager server certificate when API Portal sends a request to API Manager. You can check which certificate API Portal uses in Current certificate. Set Verify SSL host name to Yes to verify the certificate host name for HTTPS connections. Enter a tag for this API Manager. This tag can be used in API Catalog to filter APIs that come from this particular API Manager instance, especially if you plan to connect your API Portal to multiple API Managers.